Stay in one of these joyful treehouses built with families in mind. New Braunfels in Texas Hill Country is a huge draw for families wanting to tube, kayak or canoe on the meandering Guadalupe River. Located just a few steps from the river, the unique treehouse lodgings at Guadalupe River Houses put you in the middle of the action. And with options nearby ranging from the vibrant historic district of Gruene to a 70-acre water park to exploring natural underground caverns, this area may just be one of the most remarkable destinations in Texas. The Guadalupe River Houses exhibit heart and soul with Texas Hill Country style, boasting four eclectic treehouses and two bungalow suites surrounding a large saltwater pool. The wind chimes cheerfully greeted us on arrival, and the first walk-through of the quirky residence was an adventure of its own. Take a look here. The playful details throughout the property fascinated the kids with decorative wooden acorns, gnome construction workers, and a life-size wishing well by the pool. A large stone - not wood - tree was the centerpiece of our beautiful Redwood Tree Haus, creating up a charming playscape with staircases, slides, bobbing horse swings, and an irresistible mud kitchen below the main floor. Upstairs in the fully-equipped kitchen, the same sculpted tree provided cabinet space, stocked with dishes and a wine rack. Along with two bedrooms and a bathroom, the Redwood Tree Haus has two twin beds in the living room, as well as a fold-out double bed, so the entire treehouse can accommodate eight people comfortably. The single bedroom bungalows are a great option for smaller families with one queen-sized and one fold-out, full-sized bed. Both the suites have kitchens with refrigerators and stoves. Rates for the treehouses start at $250/night, while the bungalows start at $95/night. There’s a steep price increase for both, starting in June. Weekdays require a 2-night minimum and weekends require a 3-night minimum. Located right on the front doorstep of the Redwood Tree Haus is a secret passageway (the only treehouse with this feature) from the treehouse to the pool, where my kids climbed up and down from morning to night. Click here to come along. The zero-entry saltwater pool wraps around all the treehouses with a convenient cabana, picnic tables, and barbecue grills just a few steps away. A bar next to the cabana has underwater stools where we sipped drinks to beat the heat. 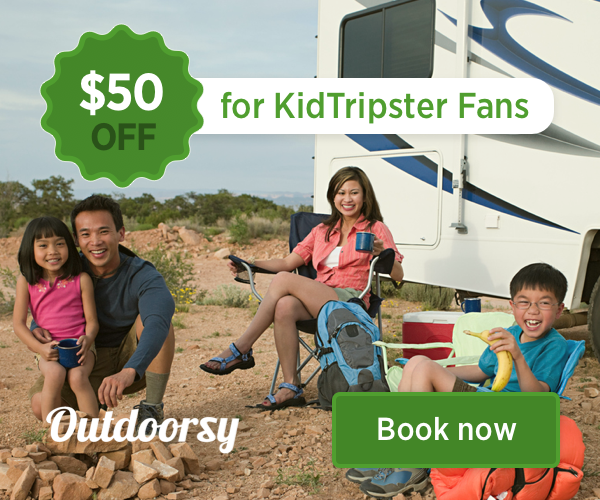 KidTripster Tip: Pets are allowed at Guadalupe River Houses for an additional $30 to $50 fee, but you need to contact management for approval prior to arrival. A short walk from the treehouse, you’ll find yourself at the Guadalupe River with a boat ramp and dock. Guadalupe River Houses provides pool noodles, but you may want to bring your own water toys. There also are dozens of commercial options for floating the Guadalupe and Comal Rivers with shuttle service and float trips available anywhere from one to five hours. I recommend Landa Falls for its free parking and life vests that come with tube rentals. Cost: $20/person; check the website for entrance options. KidTripster Tip: Arrive early for Landa Falls, as the tubes are available first come-first serve. For a full day of wet and wild adventures, head to Schlitterbahn New Braunfels (400 N. Liberty Ave.) with over 50 attractions including water slides, lazy rivers, and tube shoots. Cost: Youth (under 3) Free; Youth (3-11) $42; Adults $55. KidTripster Tip: Study the park map prior to visiting to arm yourself with information, like the highly-detailed ride ratings and the multiple food and drink stand locations. My kids were delighted to find a new favorite toy store at Got Toys (1714 Hunter Rd.) in nearby historic Gruene. Take an afternoon stroll here and explore the quaint shops. Any spelunkers in the family? Drive 30 minutes to Natural Bridge Caverns (26495 Natural Bridge Caverns Rd.) for a dark journey through rock chandeliers, stalactites, stalagmites, and soda straws. The caverns are very humid and fairly warm at around 70°year-round. Cost: Youth (under 3) Free; Youth (3-11) starts at $14; Adult starts at $22; check schedule in advance. KidTripster Tip: I recommend the Discovery Tour, a half-mile expedition which takes you up to 180 feet below ground. Be sure to wear shoes with good traction, as the rocks can be slippery. Check out the lovely, scenic view at Gristmill River Restaurant and Bar (1287 Gruene Rd. ), where traditional Texas fare is served including wonderful burgers, juicy steaks, and local Gulf Coast seafood. This sprawling restaurant nestled in the trees peeks out over the Guadalupe River, perfectly complementing the treehouse and river experience. Scoop Street (230 W. San Antonio St.) is a sweet spot to get your all natural, handcrafted gelato. Feeling a little more adventurous? Try the Jarritos-gelato float. I also highly recommend the New City Bakery (1304 W. San Antonio St.), where you’ll find a great variety of Mexican pastries with conchas, tortugas, and empanadas, but traditionalists can still get chocolate covered donuts and cinnamon rolls. Guadalupe River Houses are located in New Braunfels, Texas. The property is about a one-hour drive from Austin and San Antonio. For family ideas for Austin, click here. For San Antonio, click here. Looking to try two treehouses in one trip ? Check out my review of nearby Geronimo River Retreat, too. Writer Carla Reed first discovered the Texas Hill Country as a University of Texas student and continues to explore the area with her three boys.